The Saatchi Gallery’s new show “Unveiled: New Art from the Middle East” showcases work completed by more than 20 contemporary artists from the region, including from Iran, Syria, Palestine, Iraq, and Algeria. Avant-garde painting, sculpture and installations from emerging Middle Eastern artists adorn the space of the Chelsea gallery. 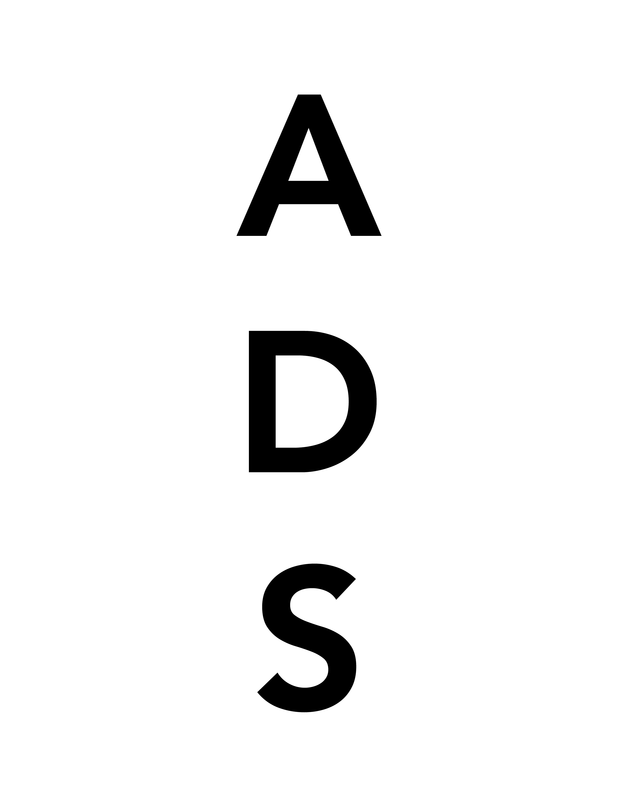 The works exhibited are hard hitting and graphic yet aim to touch upon the sensitive subjects of the region including the horrors of conflicts in the past and present exploring suppressed sensuality and the examination of a woman’s place in the Muslim world. 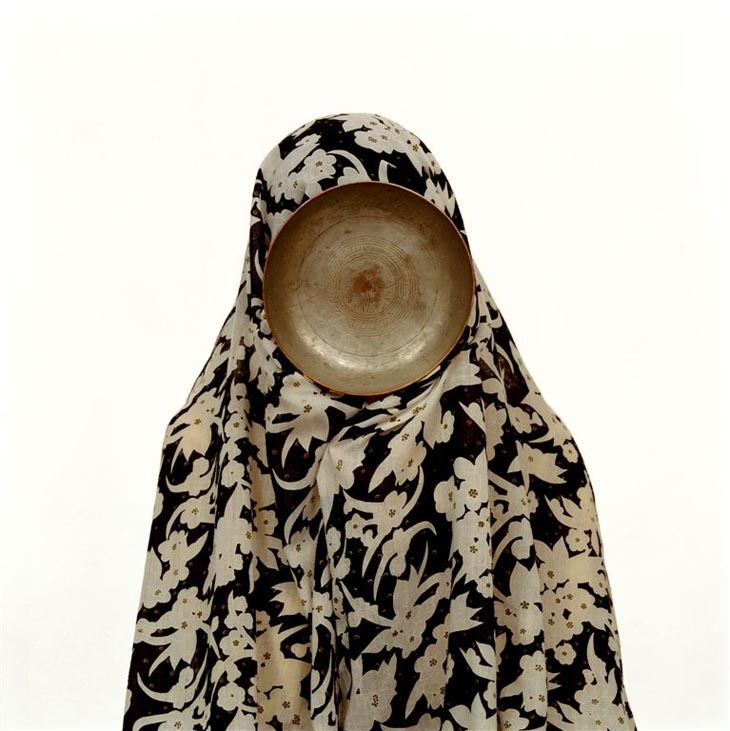 One of the most striking works is Ghost by Algerian artist Kader Attia. 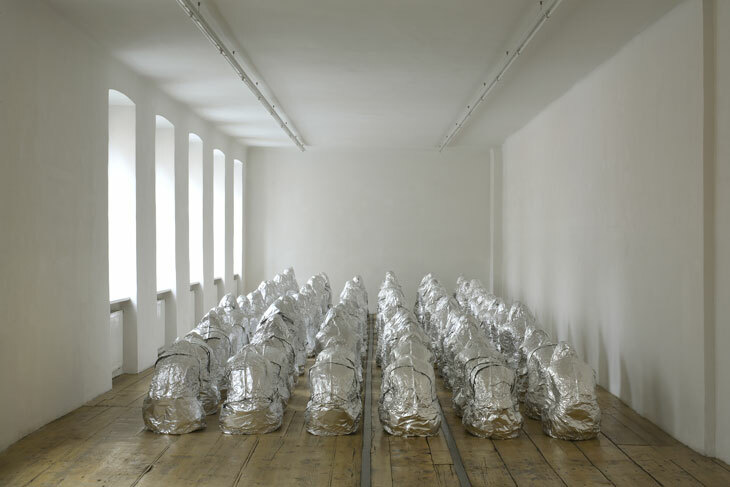 The work portrays a group of Muslim women in prayer made out of aluminum foil. It is comprised of more than 200 life-sized figures of Muslim women in hijabs bowing in prayer. When the visitor reaches the far end of the gallery and looks back he realizes that all the forms are empty. Given the artist’s Algerian nationality, the work might reference the fate of female schoolteachers and doctors who were murdered by Islamists during the Algerian Civil War in the 1990s. The artist now lives in Paris. Shirin Ghadirian’s “Like Everyday Series”, are photographs of veiled women with their faces replaced by household objects. Iraqi artist Halim Al-Karim hid in the desert for three years to avoid being drafted into the first Gulf War. According to his gallery, he only survived because a Bedouin woman brought him food and water. He takes blurred photographs of people and artifacts to recall the friends and family that were held as political prisoners at the Abu Ghraib jail under Saddam Hussein. Iranian artist Shirin Fakhim uses everyday objects such as cooking utensils to depict Tehran prostitutes that wear clothings combining Western fashion with more traditional Islamic dress. Contemporary Middle Eastern Art is one of the latest trends in the art market. “After [China’s] Tianamen Square [protests in 1989], the awareness was increased and that’s the same with Middle Eastern art,” said Rebecca Wilson, Saatchi Gallery’s head of development in a recent interview. “There is a sense of discovery. The art world loves to jump onto the next new thing!” “Unveiled: New Art from the Middle East” is on through May 9th, 2009. This entry was posted on Saturday, February 7th, 2009 at 11:02 am	and is filed under Go See. You can follow any responses to this entry through the RSS 2.0 feed. You can leave a response, or trackback from your own site.